Analysis of metabolites found in saliva is a favorable diagnostic solution, as it can be obtained by methods sample collection methods which are both a non-invasive and stress-free. 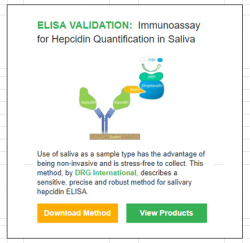 Tools such as the DRG Salivary Hepcidin ELISA can be used for the quantification of metabolites such as Hepcidin in a standardized, precise and efficient way. Are you interested in more DRG products, that are listed at Select Science?